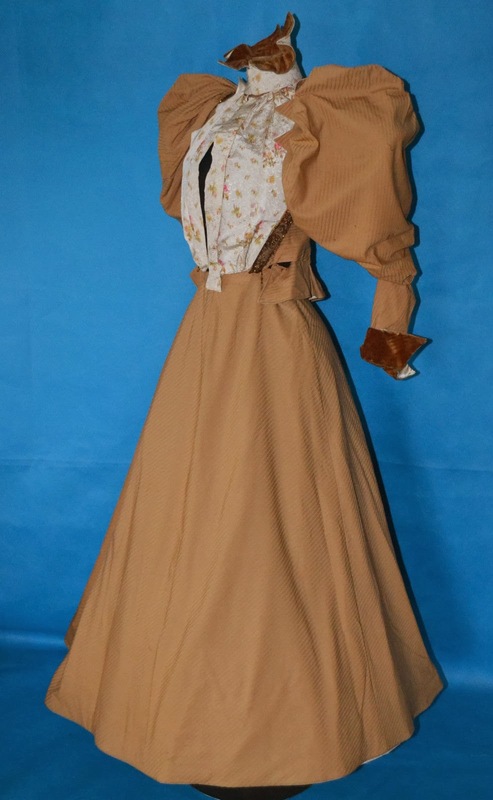 This auction is for a majestic, true antique 1800's ladies corset jacket with matching hoop skirt....in near pristine, wearable condition! Straight from a most prestigious Massachusetts estate. 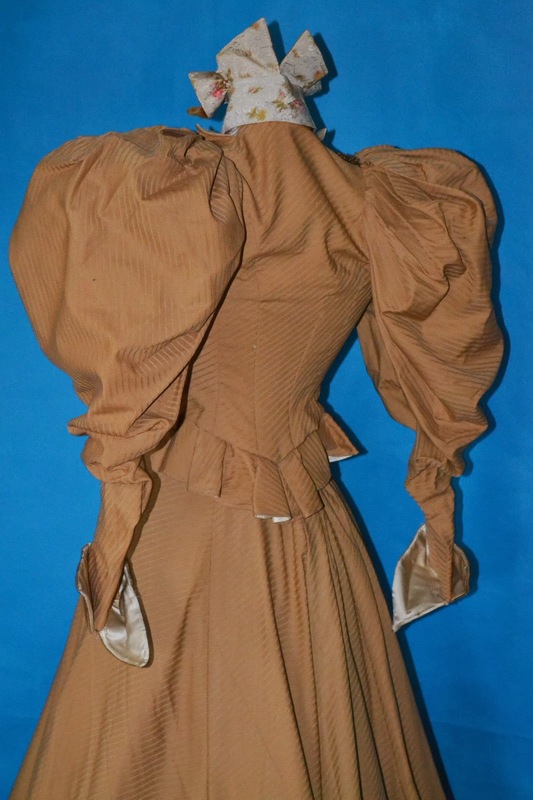 Beautiful weight butterscotch wool ensemble with elegant watered rose silk pattern bodice insert and high collar. The wool features an exceptional diagonal pattern. Striking bronze colored glass beaded & sequined trim tapers down the jacket's front. A total of six fine corset stays sewn within the fully lined bodice. Exterior collar is lined with beautiful silk velvet. Matching velvet trims the jacket's sleeve cuffs. Gargantuan Leg O Mutton sleeves with interior wires to help keep their form. 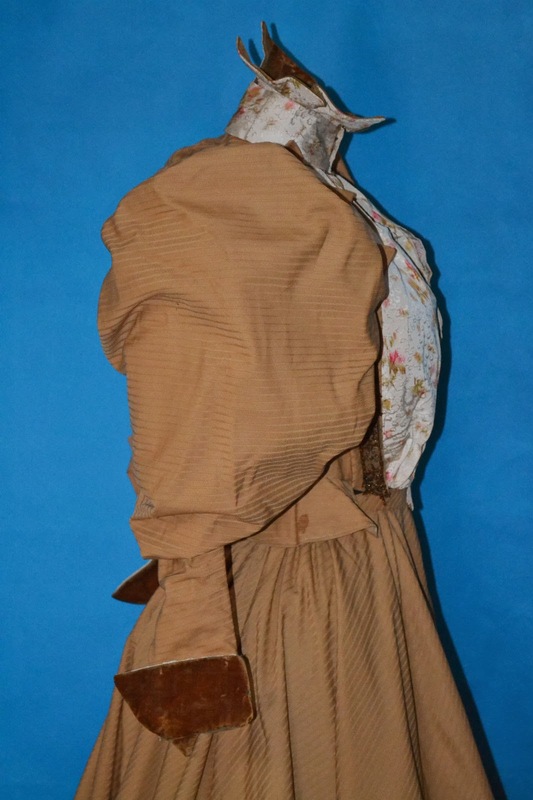 Bustle back flaps on jacket back. 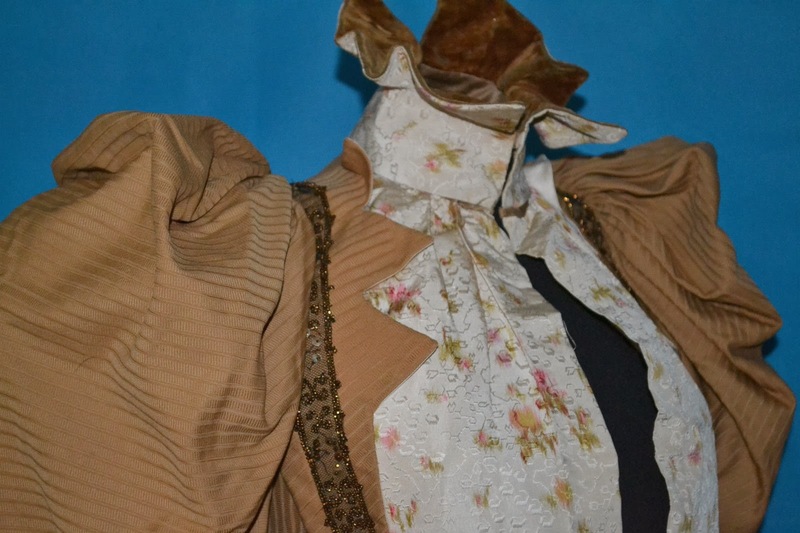 Please note that my dress form's bust was too large, so you will see that in the photos, the jacket does not fully close up the front...but off the form, it closes beautifully with early hook and eye closure up the rose silk bodice front. The inner lining features tabbed skirt supporters. 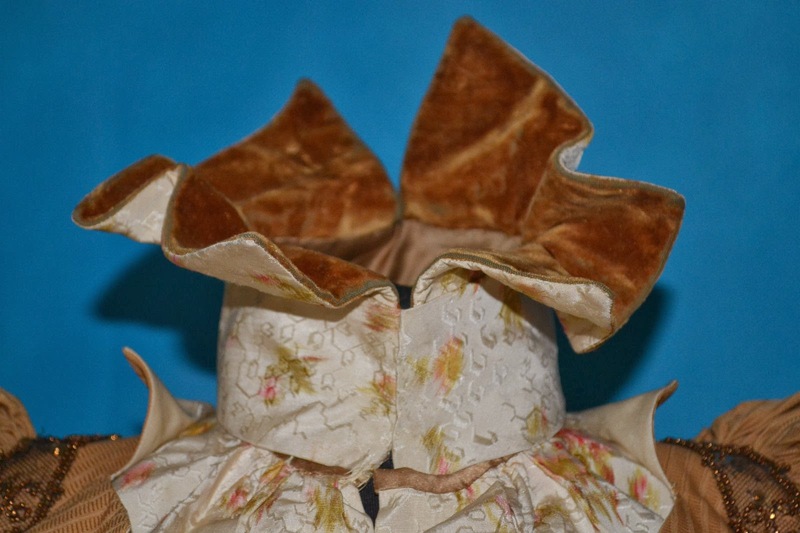 Matching eyes sewn in skirt back so that both pieces of the ensemble stay straight and together. Hidden skirt pocket with tiny little silk satin handmade sachet tucked neatly in the pocket. The matching crinoline hoop skirt flows beautifully and is fully lined in polished cotton with a banded lower hemline dust ruffle. Early hook and eye closure in back with gathers to accommodate a wire cage bustle . 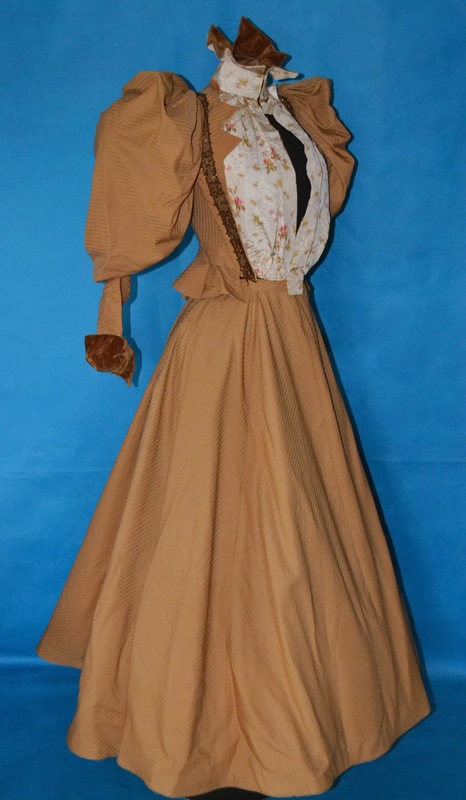 Just a most majestic 1890's Victorian dress for serious collectors. The only flaws to note are some tiny pin holes in the wool of the jacket back and leg o mutton sleeves....see magnified photo below. I haven't heard of wire supports before. I'm not discounting the possibility but the sleeve supports I've seen are either horsehair or what basically is nothing more than stuffed pillows. However, THIS IS NOT A BUSTLE BACK!!!! The S-curve corset caused your bum to stick out. 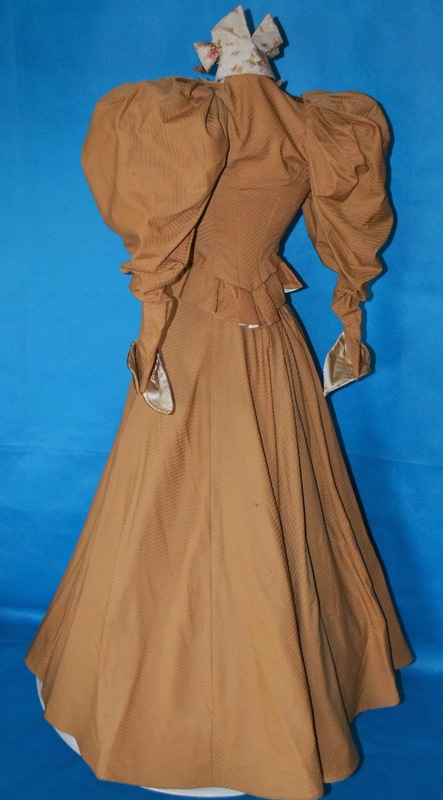 Some ladies did add to their natural assets but the bustle pretty much died with the 1880's. It seems like I saw an ad for wire supports... I'll let you know if I locate it again. LOL! 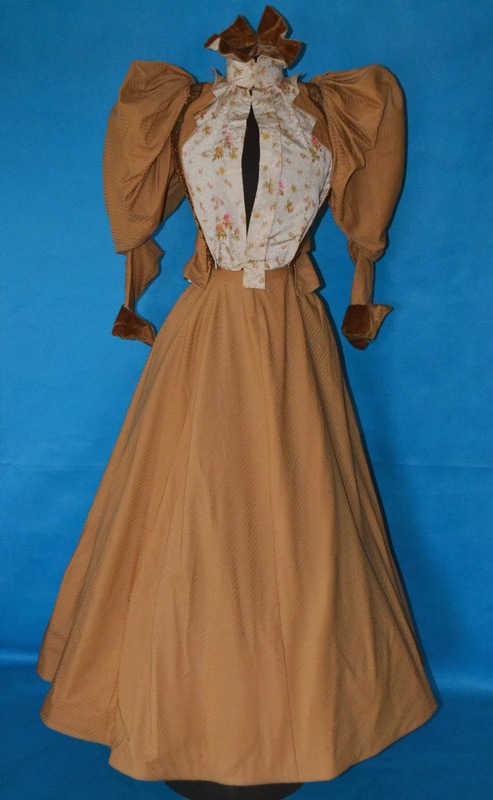 It doesn't have a crinoline hoop skirt, either. I suspect she was trying to work in all the buzz/search words she could, appropriate or not. Thanks! I'd love to see it.